LimeRock Inn is tucked away on a quiet street in Rockland’s Historic District yet steps away from downtown for a visit to world-class museums, fine dining, Main Street shopping, and what Down East magazine referred to as "mid-coast Maine's most beautiful ocean walk." Encircled by a wraparound porch and landscaped gardens, this beautiful turreted Victorian mansion is an exquisite example of Queen Anne and Eastlake architecture reminiscent of the gracious lifestyle of Rockland in the late 19th century. We blend the best of classic style with modern appointments with eight guest rooms all with ensuite baths. We are the original and authentic "live like a local" vacation rental experience! As resident owners, we offer 24 hour concierge services and daily housekeeping. And unlike our competitors, there is never a multi-night stay requirement. From the sidewalk, our wicker furnished wraparound porch invites you. Once inside, warm colors of the foyer welcome you. Enjoy a conversation on the porch or in our formal parlor or relax by the fireplace in the living room with a book from our library. There is also a TV with DVD player in the living room for your enjoyment. We have a large DVD lending library for our guests. Beyond the foyer are eight, well-appointed guest rooms decorated to create an environment of comfortable elegance. Architectural details and period furnishings evoke charm and character that enhance the overall feeling of comfort and hospitality with all the modern appointments like complimentary WiFi throughout the property to keep you connected. The Grand Manan, Island Cottage & Fox Island rooms offer king beds and the remaining five offer queen beds. All have sumptuous bedding. Each room contains a private bath appointed with Egyptian cotton linens, hair dryer, cotton jar, makeup removal cloth, rejuvenating soap, bath crystals, shampoo, conditioner & body lotion . Each room also contains a flat screen TV, iPod/MP3docking alarm clock, charging station, complimentary bottled water and air conditioning (in season). The Grand Manan, Island Cottage and Monhegan rooms offer whirlpool tubs. The Grand Manan room has a fireplace. In-room massage therapy by a licensed therapist can be arranged during your visit. Don’t hesitate to ask us for more details. In-season rates range from $169.00 to $249.00. LimeRock Inn is situated on just under an acre of land and has one of the largest in town lots. 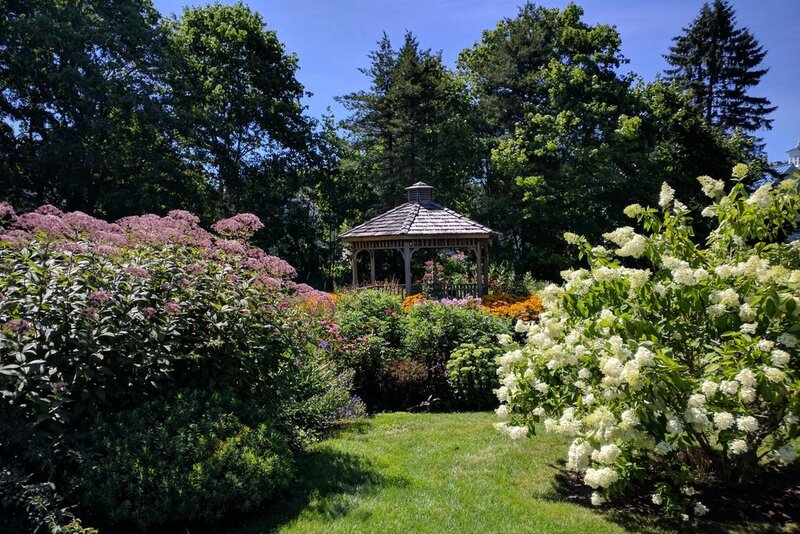 The Yard is comprised of informal English gardens with a casual arrangement of many different types of annuals, perennials and flowering shrubs. The informal composition of a traditional garden style reflects our property theme of “comfortable elegance”. We offer secure, high-speed wireless internet. Those traveling without a laptop can use the desktop computer in our guest amenities center. The guest amenities center also includes an all-in-one printer, scanner and fax machine in order to meet your needs during your stay with us. We are located a block from the Knox County Courthouse and other downtown businesses making us an ideal alternative to traditional lodging.